Detroit The widening gap between black and white homeownership didn’t happen by accident. There is abundant evidence and little debate that the gap was the result of historic discrimination enforced by federal policies, state laws, and local ordinances. Even as ownership rates increased for minority homeowners over a 40-year period thanks to persistent work, legal action, and regulation of bank lending discrimination, the banking and real estate industry speculative bubble wiped out almost all of these gains through foreclosures and the credit desert that emerged after 2008. 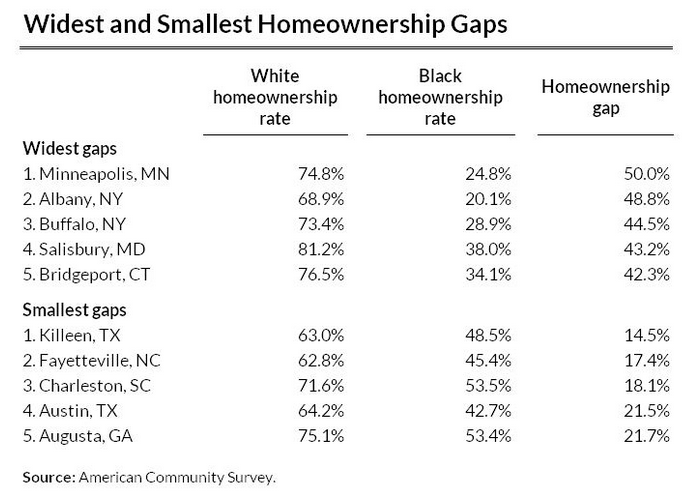 Meanwhile the gaps in black and white homeownership are huge and little to nothing is being done to make up the distance. A recently released report by the Urban Institute, hardly a liberal bastion as the think tank of developers and real estate interests, looked at the racial divide in the 100 largest cities in the United States. Few cities could claim any bragging rights other than being the best of a bad bunch. The reports authors were clear that the South and West were better than the North and Midwest, but mostly this was a race to the bottom. The smallest gaps were Killeen, Texas at 14.5%, Fayetteville, North Carolina at 17.4%, Charleston, South Carolina at 18.1%, Austin, Texas, the largest city in the best five at 21.5%, and Augusta, Georgia at 21.7%. The hall of shame was led by Minneapolis with an outrageous 50% gap, Albany, New York another state capital had a 48.8% gap followed closely by Buffalo, New York with a 44.5% gap, Salisbury, Maryland on the eastern shore with a 43.2% gap, and Bridgeport, Connecticut, where ACORN once ran one of our most productive housing counseling programs with a 42.3% gap now. Looking at large metropolitan areas with the largest number of black families doesn’t make the picture any prettier: New York City 34.6%, Chicago 35%, Atlanta 29.6%, Philadelphia 26.3%, and Washington, DC, 23%. Looking at cities where the ACORN Home Savers Campaign has been organizing is sobering as well: Pittsburgh 41.6%, Youngstown 41.8%, Cleveland 38.3%, Detroit 37.9%, Little Rock 33.5%, and Memphis 31.8%, along with Atlanta just below 30%. Where we have union offices Dallas is at 31.9%, Houston 29.9%, New Orleans 27.2%, Baton Rouge 30.1%, and Shreveport 31.2%. It feels no better to know that Milwaukee is at 40.7%, St. Louis 35.1%, Charlotte at 32.9%, Boston 32.4%, Phoenix 40.6% and Tampa-St. Pete at 32.5%. The report says western cities are better, but Los Angeles is the best with a 23.4% gap, San Francisco 29.8%, San Diego 28.9%, Las Vegas 30.8%, Denver 31.5%, Sacramento 33.9%, Portland 34.4% and Seattle 37.2%. You won’t drive into any city and find a sign celebrating this gap. Whether blue or red, the gaps are significant everywhere, and they are barriers to equality and obstacles to a flourishing democracy. The New York Times in an editorial mentions that all of this has also opened up the door for predatory land contracts to surge which is what the ACORN Home Savers Campaign is all about, but noticing the obvious is not a program. Sadly, the current administration and little of anyone else in government, real estate, or banking has much to offer as a solution to discrimination this profound and persistent. Little Rock According to researchers at Yale University, it’s the old story with a twist. It’s not “see no evil, hear no evil, speak no evil,” but “see no evil, hear no evil, and speak all evil,” at least when it comes to creating a mental dreamscape for the rich and most white Americans when it comes to understanding the persistent gap in economic progress for African-Americans. A new study published in a peer-reviewed scientific journal by Yale researchers finds that people, especially wealthier, white people have convinced themselves that African-Americans are making great progress over recent decades in narrowing the economic divide created by years of discrimination. The researchers found that across all groups in their study the progress made by African-Americans was overestimated by 25%. Lower income whites came closest to understanding the gap still persisted, and wealthier whites missed the reality by the largest margin. All this in the words of the lead researcher, Professor Jennifer Richeson, was “shocking,” because it was so at odds with reality, because in their view, how can you solve a problem, if you are in denial that the problem even exists. All of this comes in the wake of recently released Census Reports based on the true facts rather than the alternative reality being seen from above with rose-colored glasses. The US Census finds that African-Americans are the only group that has not made progress since 2000, even as others have advanced. Furthermore, the federal figures indicate that African-Americans are pretty much in the same place on the economic divide measure inequality as they were 50 years ago. So many of us grew up hearing this story about America that basically said there was slavery and then that was fixed. Martin Luther King marched and then that was fixed. And then we had Obama. That’s a nice, clean story that makes everyone feel good even though it’s shockingly inaccurate. The researchers found that the myth of an American meritocracy was most delusional among the wealthiest Americans who want to believe that their success, wealth and position in society is based on something they earned, rather than privilege and advantage, especially if achieved as the result of de facto discrimination. 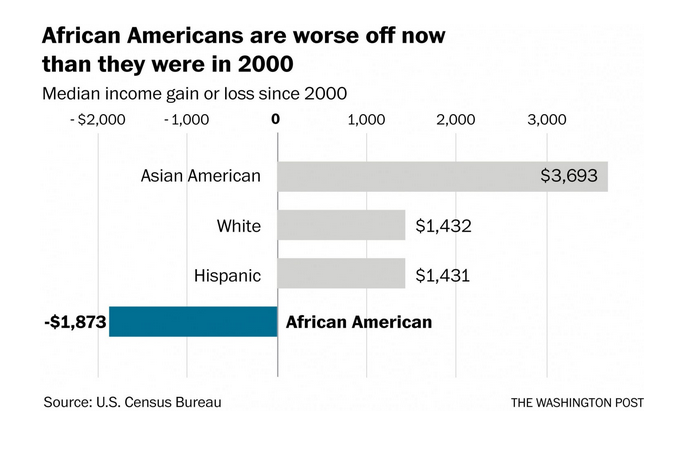 Yet the facts of the Census indicate that African-Americans only gained $5 of citizen wealth for every $100 gained by other groups. Meanwhile as the researchers observe, and our own daily lives and work establish every day, persistent discrimination in bank lending, housing and educational segregation have no effective policy or programmatic cures, so the inequality widens, rather than shrinking even as the economy improves. The crisis is exacerbated when we also consider their average survey gap would have departed reality to an even more distant white people planet, if the current occupants of the White House and Congress had been among the survey groups.